German Chancellor Angela Merkel yesterday (28 September) hailed French President Emmanuel Macron’s new vision for Europe as EU leaders held a frank debate on reforming the bloc. The leaders met in the Estonian capital Tallinn two days after Macron used a major speech to call on his counterparts to recommit themselves to a European project hurt by Brexit, the rise of populism and the migrant crisis. Merkel, a European veteran who emerged with a weakened mandate from German elections at the weekend, said before meeting the 39-year-old Macron that EU leaders should move quickly on reform based on his plans. “There is a wide agreement between France and Germany when it comes to the proposals, although we must work on the details,” Merkel told reporters before EU leaders sat down for dinner to discuss the raft of reforms proposed by Macron. The young French president introduced his ideas at the three-hour dinner at the Kadriorg Palace in Tallinn, a former summer palace for the Russian Tsars that is now a national museum. 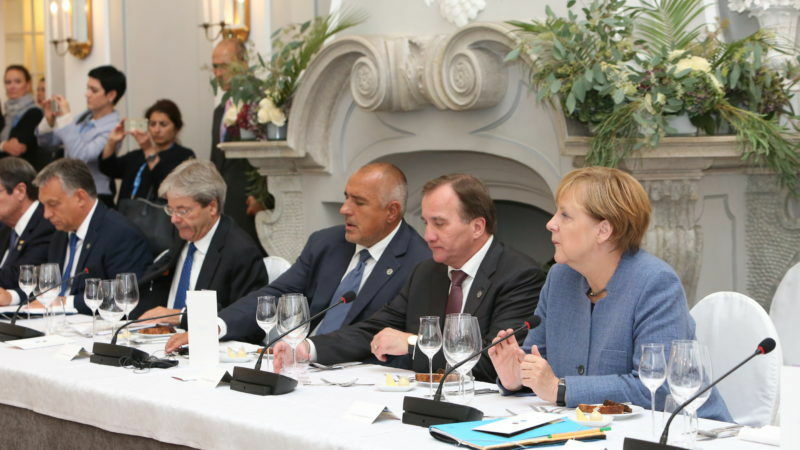 The leaders discussed the ideas – over courses of flank steak, salmon and rabbit liver – “in a very constructive and positive atmosphere”, an EU source told AFP. Based on the discussion, Tusk, who coordinates EU summit meetings, “will consult with his colleagues in the coming two weeks and propose how to take the work forward”, the EU source added. British Prime Minister Theresa May was also present for the summit, and was set to meet Merkel for a bilateral discussion on Friday as well as a visit to a NATO military base with Macron. Brexit negotiations, however, were not on the official menu. The dinner discussion on the EU’s future will be followed on Friday with talks on digital issues, a priority for tiny Estonia, which holds the bloc’s six-month rotating presidency. Also at the dinner was European Commission President Jean-Claude Juncker, who set out his own vision for a more deeply integrated European project in his annual State of the Union speech earlier this month. “European horizons drawn. Important to avoid mirages in the desert on the way,” said Lithuanian President Dalia Grybauskaitė in a first open critique of Macron’s ambition. Macron’s speech came days after Merkel won a fourth term in a vote that nevertheless saw historic inroads by Germany’s hard-right. 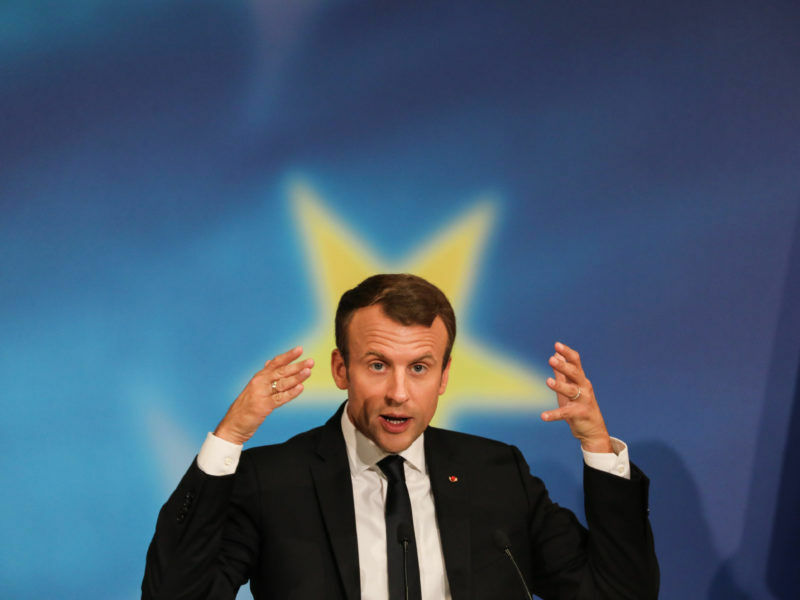 While her comments show the decades-old Franco-German axis at the heart of the EU is alive and well, Europe is now watching closely to see whether Macron starts to take the mantle of most influential leader from Merkel. Macron also included a new type of tax on technology giants like Facebook and Apple – based on how much value they create in a country rather than their profits – a controversial proposal that the leaders will discuss on Friday. Estonia bills itself as being at the avant-garde of the digital revolution and originally called the talks to help bring the rest of the bloc up to speed.